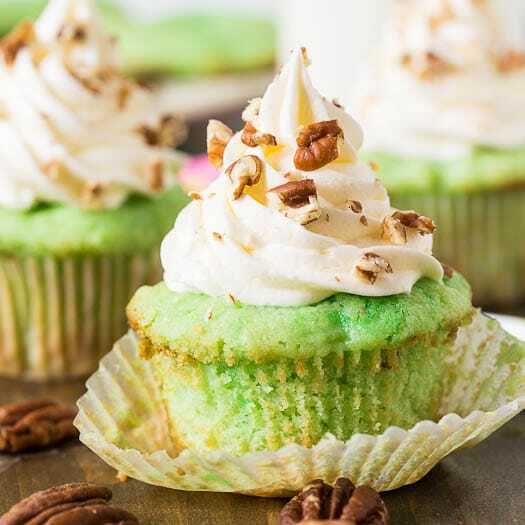 Watergate Cupcakes are the cupcake version of the famous Watergate Salad made from pistachio pudding mix, pineapple, cool whip, and marshmallows and they are the perfect nostalgic treat. 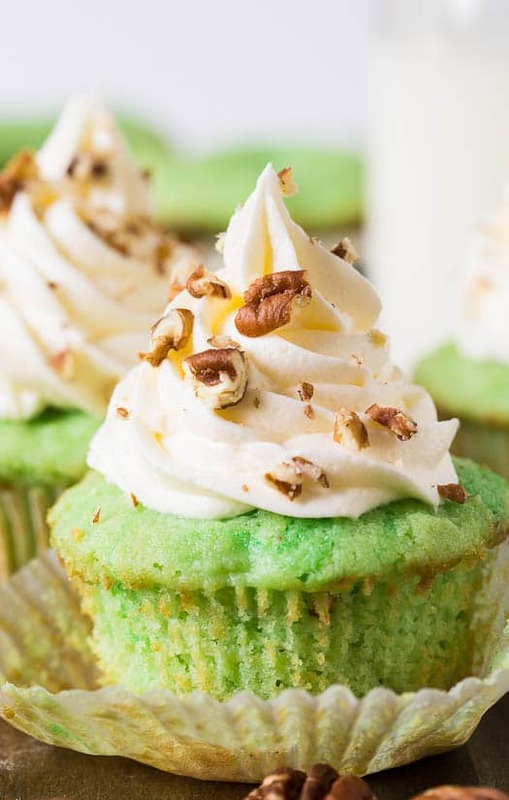 To make a cupcake version as close as possible to my Watergate Salad Recipe, I added a box of pistachio pudding mix and an 8-ounce can of crushed pineapple to a vanilla cupcake batter. Most Watergate Cake or cupcake batters are made by doctoring a box of cake mix, but I was in the mood to make one from scratch. The cupcake part is super moist with just a little texture contrast from the crushed pineapple. Both the flavor of the pistachio and pineapple are evident, but not overpowering. I put in about 6 drops of green food coloring to make sure the cupcakes were extra photogenic, but the pistachio pudding alone will give them a green hue. Since Watergate Salad has marshmallows mixed in, I wanted to incorporate them somehow and I decided to use marshmallow fluff to make the frosting. 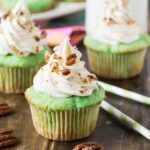 Mixed with butter and confectioners’ sugar, it’s a light and sweet frosting with a velvety smooth texture. This wouldn’t have been a cupcake I would have enjoyed when I was younger. Nope. I was all about the chocolate then. And the fact that I like them now is definitely a sign that I’m getting older. Like maybe not that many years away from being a grandma old. And the thought of that makes me want to go back to eating nothing but chocolate. But seriously. 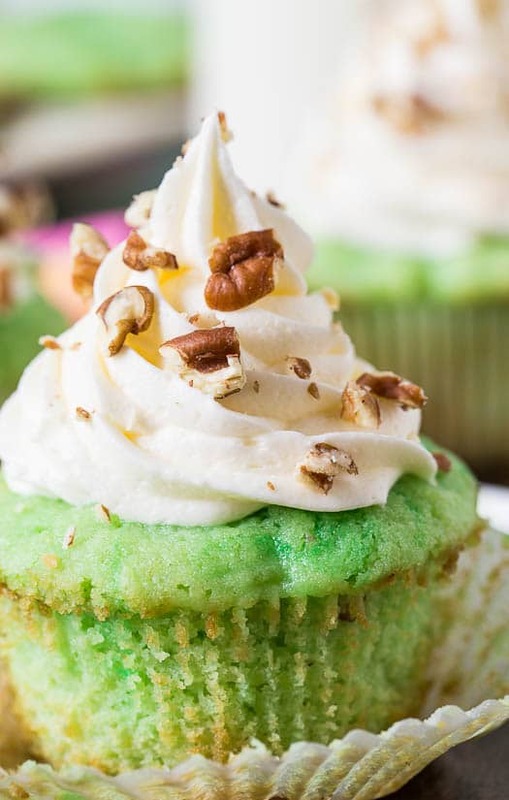 A green cupcake covered in marshmallow fluff frosting. That’s super fun. Preheat oven to 350 degrees and line 12 muffin cups with cupcake liners. Using an electric mixer, beat butter and sugar together until light and creamy. Add eggs one at at time, stopping to scrape down sides of the bowl. With mixer on low, add in remaining cupcake ingredients. Turn to medium-speed and beat for about 20 seconds, or until batter is an even consistency. Pour into prepared cupcake cups and bake for 18-22 minutes or until a toothpick inserted in center comes out clean. Let cool. 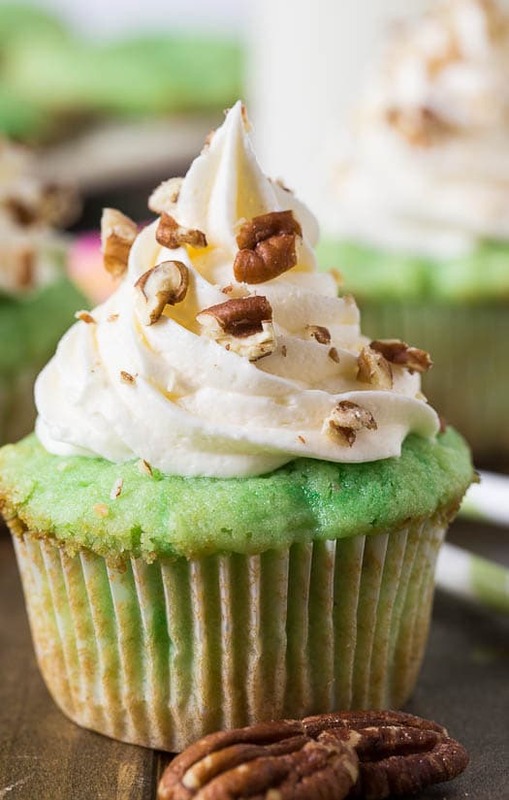 To make frosting, use an electric mixer to beat butter and marshmallow fluff until smooth. Gradually add in confectioners' sugar. Mix in vanilla extract and milk. Spread frosting on cupcakes. This is easiest to do using a pastry bag or plastic bag with the corner snipped off. Sprinkle with pecans. You might also like this Watergate Salad. This entry was posted in Cakes, Desserts and tagged cupcakes, marshmallow, pistachio, watergate salad. Bookmark the permalink. Hi – my daughter would love these for her birthday but doesn’t like pineapple. Are there any adjustments or substitutions I have to make when I omit the pineapple? I have never made these without pineapple and you would probably need to add a little more liquid if you omit it. But you really can’t taste the pineapple. What size jar of marshmallow fluff? These look amazing!! The smaller jars, I think they are 7 ounces. And I really shouldn’t say Marshmallow Fluff because I used Kraft Marshmallow Crème but they are pretty much the same thing. Hope you enjoy! How fun! My family used to make Watergate salad all the time. It was a total staple at Sunday dinners! 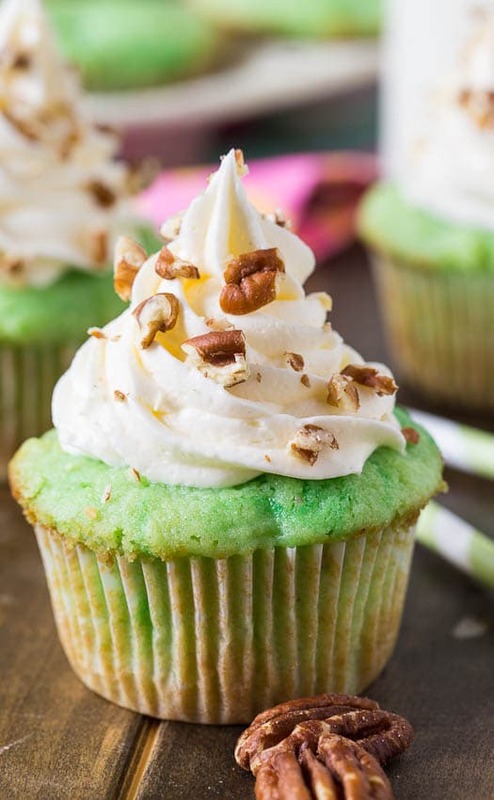 Wow, the cupcakes look great but I have never heard of Watergate salad and have never seen pistachio pudding, Maybe it’s indigenous to the South, reminds me a little of ambrosia just because of the whipped cream or whipped topping. I will have to try this is sounds really good. I will have to look for that pudding. These cupcakes are so fun and adorable! I love the pistachio pudding and pineapples in here too and the color is so so pretty! Oh girl these cupcakes look amazing!!! These are so fun! 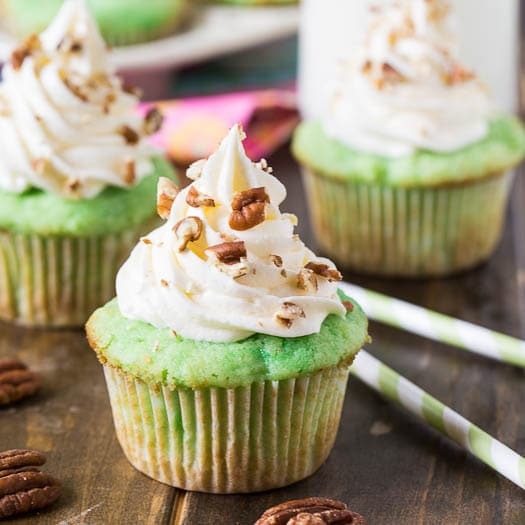 Between the pistachio, pecans and that marshmallow frosting these sounds awesome! And the color sure is pretty! Oh – I love pistachio! These cupcakes are really pretty and creative. ooh i am so craving a cupcake right now.. they look delicious! The color of these is so beautiful!! I bet the flavors are just as good. These cupcakes look gorgeous, Christin! You could sell these from a bakery! I love the pistachio and pineapple flavors in here. Such a fun combination!